Add the curry paste and a little zest from one of the lemons then stir for 2 minutes. Add the chicken stock and lemon juice and bring to a low boil. Reduce heat and simmer for 10 minutes. Take off the heat and then serve in soup bowls (even a large mug would be lovely). Garnish with coriander and eschallots to serve. A very creative and unique recipe, thanks for sharing with us. The turkey breast mince is an interesting addition,thanks! This soup looks delicious great flavors. Thanks for sharing ! I have never tried. Will definitely need to give this recipe ago. my husband is a big fan of hot and sour soup – I would never have thought of making it at home! or including turkey – thank you so much for sharing your recipe – I am looking forward to making this for my husband. A different take, not one I would had thought of. Have pinned for the weekend. 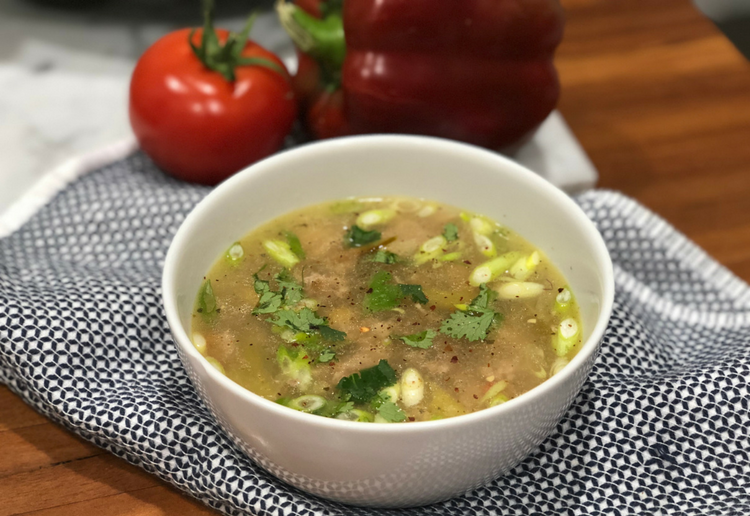 A simply yummy looking soup – so very different and quite keen to try this soup with turkey mince – thank you! Love the coriander in the recipe too – coriander always make a soup perfect for me.